The risk taking assessment is done by asking each student to evaluate himself by answering several questions about how he rides and his attitude on different aspects of riding(Risk Scale). He also answers questions about his perceived skill level on a motorcycle(Skill Scale). After accumulating a score on both of these scales, he then plots it on a graph to determine his Relative Risk, whether he is a higher or lower risk rider. I cannot find the questions in my course materials. Note: To my recollection this is only done in the Advanced Rider Course ... BRC 1 and BRC 2 do not include it in the course.
. . . asking each student to evaluate himself by answering several questions about how he rides and his attitude on different aspects of riding(Risk Scale). He also answers questions about his perceived skill level on a motorcycle(Skill Scale). After accumulating a score on both of these scales, he then plots it on a graph to determine his Relative Risk, whether he is a higher or lower risk rider. I cannot find the questions in my course materials. Thanks for that; anyone here who's a current RiderCoach who can add any background, particularly on the research underpinning it? I presume a self-awarded high mark for 'perceived skill' is actually marked as 'bad'? Do you know about a concept called the 'Surprise Horizon'? No, but I would like to hear about it. In the meantime, I will speculate that it is something like this: The distance less than which an unpleasant surprise cannot be avoided. I wrote about a related idea here: The 4-Second Rule. 2. Where is the earliest / nearest point at which you could be surprised? Assuming you think there's a difference :) , which do you use to determine braking distance and so speed? Odd. It showed in 'preview' . . .
A footnote on one of the pages, "For more information about this concept and Risk Homeostasis, refer to Target Risk 2 by Gerald J.S. Wilde. PDE Publications, Toronto, 2001." Great example. Potential danger isn't just what's beyond view; it also includes what could suddenly appear at a point within view. The scales for plotting skill and risk can be found in the MSF Basic RiderCourse Handbook (big PDF). See document page 19, PDF page 25. They also appear in a presentation, Rider Choices Save Lives (not-as-big PDF). Scroll down to slide #23 and following. Questions for rating on the two scales do not appear in either source. It can rely on a huge amount of 'engine room' work behind the scenes to provide estimated relative scoring. Thanks DataDan I looked at the links you provided and realized that I took the BRC1 and BRC2 several years back. The material used for my BRC was published in 2010 and back then it only covered the "Ladder Of Risk" which was not as enlightening. The links you provided show a much improved course. What this says to me is that the courses are even more valuable to a rider today than they used to be. Here is another thought. Most riders that do not go to safety courses never get exposed to many of the concepts of safety. They also do not perceive many of the risks. Yes, this forum is an outstanding collection of great information but, the number of readers is most likely a small percentage of the overall riding public. Here's the next chunk of the story . . . Bright red line leads to the limit point. As it's straight, the bends leading to a straight. Yee-hah! Off you go! But . . . Where's your maximum stopping distance? The red line is the far kerb - so high likelihood of oncoming traffic. The white centre line has an orange line for 'your side'. But . . . how do you know what's behind the hedge (yellow edging)? Simply, you don't. 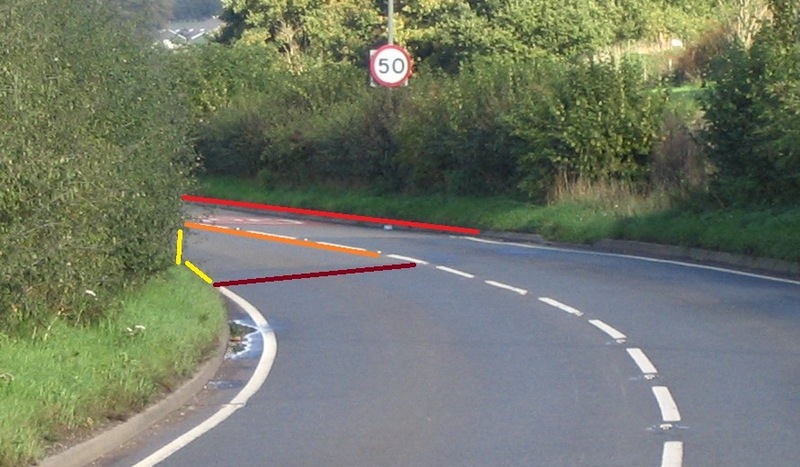 If anything emerges, then it's potentially going to block 'your' lane, so your stopping distance that you can reasonably expect to remain clear is bordered by the deep red line. You mention 'Roadcraft' . . .
1995 edition of the [heavily-revised] car Roadcraft. 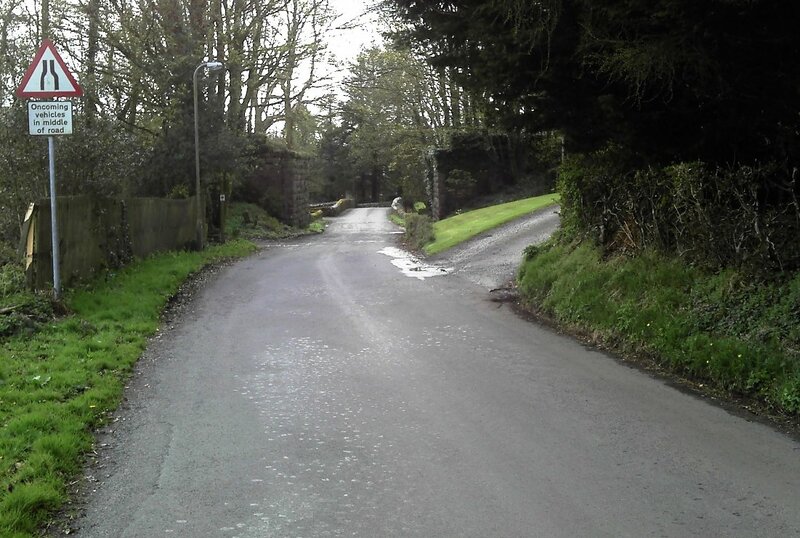 The limit point is the furthest point along a road to which you have an uninterrupted view. On a level stretch of road this will be where the right-hand side of the road appears to intersect with the left--hand side. To drive safely you must be able to stop on your side of the rod within the distance you can see to be clear - that is the distance between you and the limit point. The ability to stop on your side of the road in the distance you can see to be clear determines how fast you can go. Now, to me that's muddied it. Initially we're told LP is 'where both sides meet', then 'your side' gets added in. So back to my diagram and there's the 'far side' LP, the nearer centre line ('your side of the road'), but this Rc definition doesn't allow for 'surprise'. Yep, all the rest becomes a moot point if someone or something pops out from behind the hedge on the right or out of the hidden driveway on the left. The nearest possible danger is the one for which a rider should prepare. So many people think "I'm an above average " . I do have the RLaP video, and set up the cones on a semi-regular basis. Of course one does not need cone to do PLP , but they help if you have a couple of friends who want to brush up. I find when I have an observer they can spot my weak areas better than I can. So many people think "I'm an above average " . . .
For self-evaluation to be effective you need to know what you *should* be doing. In training-speak, "Knowing what 'good' looks like". Then there the necessity of being honest about what you are doing against that 'gold standard'. Interestingly, with the example you give, you do know what you should be doing in your PLP, but choose not to! Perhaps you need to consider 'why' that is . . . The "why" is actually very simple.... I have spent the past 40 plus years as a surveyor. My basic job description is to "observe, measure, and record". In order to do my job effectively, I am constantly scanning. My eyes are in movement all day long. As you may imagine, constant scanning, is very helpful when operating a motorcycle, or car. However during PLP I (usually) eliminate exterior distractions, and focus on skills that may, or may not come into practice while riding. Figure eights, tight u-turns, offset weaves, etc require a much sharper angle of my neck and head than normal operation. I can hear my instructor saying "further...further".... or " chin on the shoulder". It isn't that I do NOT turn my head to an acute angle, but rather that I need to practice, and in practising, perfect my technique. Apologies, I read your post as meaning that you didn't turn your head *during* your PLP, and you needed a second person/coach to remind you, rather than using the PLP to reinforce the best practice. But the 'trick' is that I heard that voice on the *approach* to each corner - I'd have had to make a conscious decision to ignore the virtual Ralph and revert to something else. So is the 'trick' for you to use self-talk - but early enough to be something you put into use? Plan your cornering rather than just wait and see what happens? There's a new version of the BRC that has something similar, but not all training programs have transitioned to that, and there is no requirement to do so. Back when I was working on my PhD I paid for my ramen through teaching the MSRC for Marines. The class starts with the same risk assessment mentioned in the ARC with the Zuckerman inventory to set a risk score and a student self selecting their skill score. As you can imagine- every Marine felt he was the bees knees. No worries, we took them on the range and pressed them hard. We added a session at the end of the class to have the Marines re-evaluate their skill level. Without fail they knocked their skill assessment down a notch and realized their risk score changed dramatically. That helped us get more interest in command level riding clubs. We'd help them setup parking lot practice sessions, got them to on base and local track days, setup safe rides and did adjunct seminars on safety to include reports on recent crashes in the area (very few were Marines). In my experience, if you can setup the self-evaluation to be challenged by real life events - you're going to get a better result.